The war between good and evil has been going on for quite a long time. It's been full of drama. There was that thing with the snake at the very beginning since then the world has been full of ups and downs. First keeping the peace was all about the bad, bad basics. Cain gets jealous and attacks his brother. People forgot about the big man upstairs and worshipped golden calves. Basically, people were mean, jealous, and thoughtless. Now things have started to get more complicated. Angels have to worry about different kinds of atrocities. While worshipping golden calves isn't as popular, people come up with all sorts of new sins such as putting pineapple on pizza and writing emails in all caps for no reason. These new modern sins don't call for fire and brimstone but they sure do keep angels busy trying to save people from themselves. You'll be golden once you get ahold of this costume. The top has layers with a shoulder pad. The top has ab details and a harness to make you look ready to fight. The costume features a warrior like a tunic with a white layer underneath. With brilliant white wings, you'll be ready to set people on the right path as soon as you slip this on. Are you ready to have your very own spot on a cloud? We hear it's pretty comfortable up there despite the constant harp music. Pair this ensemble with a sword and shield as well as a pair of gladiator sandals. There's no reason to try and set the world straight all on your own. 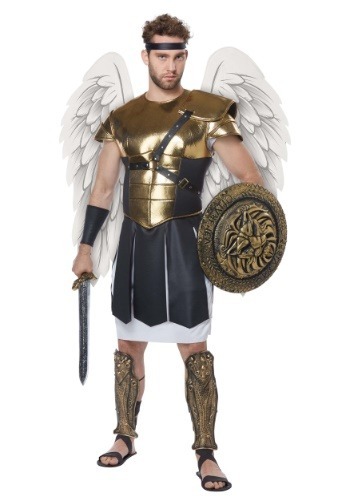 Pair up with other angelic figures to make Halloween a little more holy. One thing is for sure. When you're around, people will surely refrain from their sinful pineapple pizza ways.